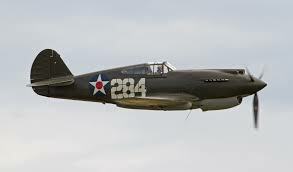 On March 1, 1942, a Curtiss P-40E, (41-5547) piloted by 1st Lt. Charles R. Fairlamb, was making a normal landing at Quonset Point Naval Air Station when the aircraft’s right landing gear suddenly struck a small pile of snow about two feet high that was on the runway. The jolt caused the landing gear to collapse, which caused the right wing to fall and drag along the tarmac causing the plane to rotate 90 degrees. As this was happening, the left landing gear suddenly collapsed dropping the plan causing damage to the underbelly and propeller blades. As the plane came to rest Fairlamb cut the switches and quickly climbed out of the plane. The accident investigation committee did not fault Lt. Fairlamb for the accident, noting that the pile was not visible from the air, and had been covered with sand. Lt. Fairlamb was assigned to the 66th Pursuit Squadron (I) as Squadron Operations Officer. He received his pilot’s rating March 14, 1941. Lt. Fairlamb was later promoted to Major, and became the Commanding Officer of the 66th Fighter Squadron while serving in North Africa. He flew 48 combat missions before being injured in a tent fire while serving in Libya.